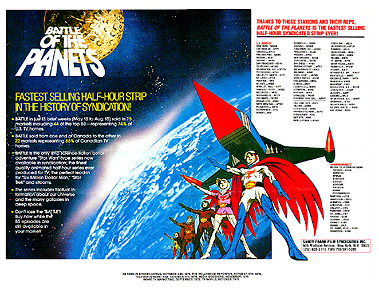 A promotional poster detailing all the North American markets in which Battle of the Planets had pre-sold. It was issued as an incentive to get additional TV station program buyers to purchase the series. 1978 or 1979, by Sandy Frank Entertainment. 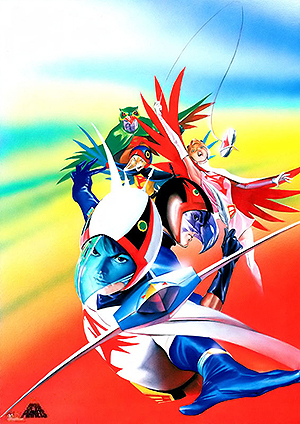 A full-color poster featuring original art. It was offered through comic books and other kids’ publications. A slightly different version of this poster was also offered in Spain. 1979, by One Stop Posters. 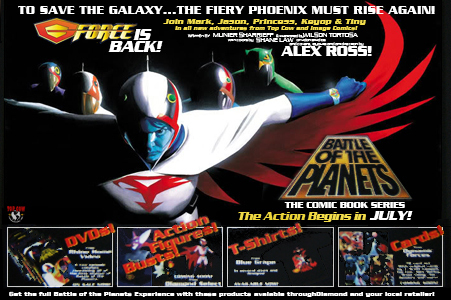 This poster was done to promote all the upcoming Battle of the Planets products that were to begin release from mid 2001 onward - Comics from Top Cow Productions, DVDs from Rhino Home Video, action figures and busts from Diamond Select Toys, T-shirts from Blue Grape and trading cards from Dynamic Forces. The poster was given away to comic stores and at various comic conventions. 2001, by the above companies. 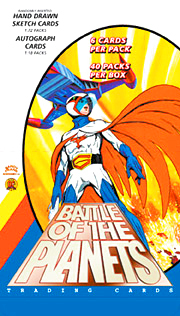 A promotional sticker created to accompany the release of the first two volumes of Battle of the Planets on VHS and DVD. It was updated the following year to announce volumes three and four. The front image on both stickers was the same. 2001 and 2002, by Rhino Home Video. 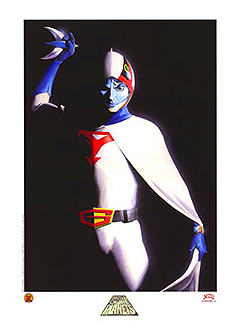 This lithograph was presented on thick card stock and featured an image that was initially created for a Wizard magazine article. The lithograph was offered in the standard edition (pictured above), and a signed edition by Alex Ross. The very same image was also offered as a high quality giclee print that included a signature and small original sketch by Alex Ross. 2001, by Dynamic Forces. These two lithographs were presented on thick paper stock. Both featured artwork by Alex Ross. 2001, by Dynamic Forces. 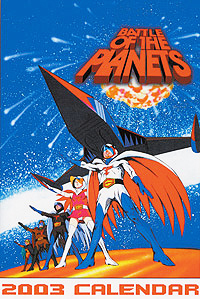 The base set of Battle of the Planets Trading Cards. 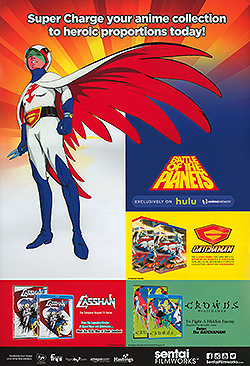 Several promotional cards were issued, along with chase subsets including cel cards, store incentive box top cards, autograph cards and sketch cards. Pictured are the retail card display box display and one of the outer wrappers. Artists involved in creating original art for the cards were Mike Allred, John Cassady, Brian Ching, Alex Horley, Jae Lee, Pat Lee, Kevin McCarthy, Yanick Paquette, Dan Parsons, Brian Rood, Alex Ross, Udon Studios and John Watson. Classic art included pieces from Japanese and European products and promotional items, with contributions from people like Ippei Kuri, Yasuomi Umetsu, Roberto Ferrari and Nadine Forster. The text on the card backs were written by your site's host, Jason Hofius. 2002, Dynamic Forces. 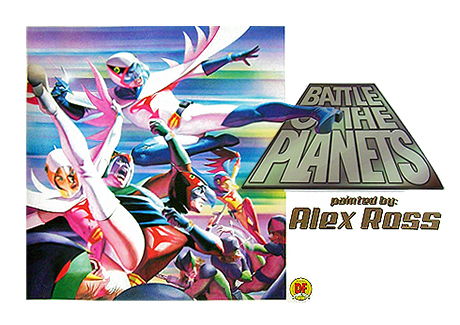 This full-color promotional poster featured Alex Ross' art from the first issue of the new Battle of the Planets comic book. It was first given away at the 2002 San Diego Comic-Con. By Top Cow Productions. 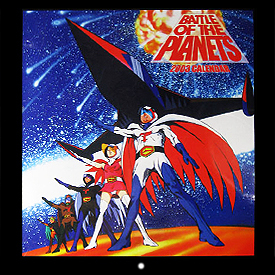 The top image was the twelve month 10"x10" full-color 2003 Battle of the Planets calendar as issued. It was printed on medium weight glossy card stock. The bottom image was a rejected size format and cover design. 2002, by Diamond Select Toys. 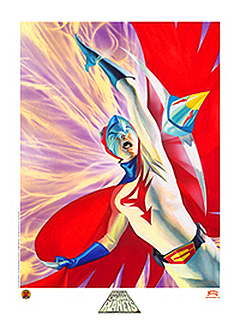 This full-color promotional poster with art by Alex Ross was first given away at the 2003 San Diego Comic-Con. 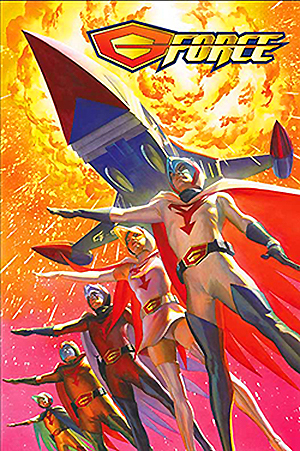 The art was from issue 12 of the new Battle of the Planets comic series, when there was the possibility of a spin-off named G-Force. By Top Cow Productions. 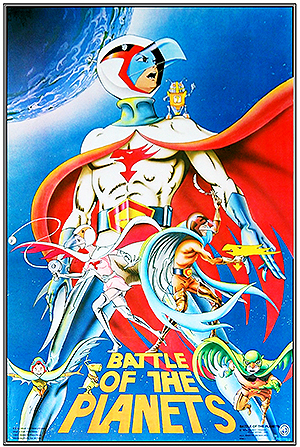 A promotional poster was issued to announce the arrival of Battle of the Planets on the Hulu streaming service, as well as other Tatsunoko-licensed home video releases. One side of the two-sided poster featured a drawing by your very own site owner (shown above), while the second side (viewable on mouseover) featured an older promotional image. The poster was given away at Anime Expo and the San Diego Comic-Con. 2014, by Sentai FIlmworks.